Example: - Suction pressure too high. Driving the pump, instead of "doing its thing". You have the hardware already? LDi has the tools. Certified calibrated signal conditioned transducers. 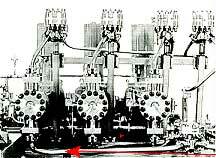 Real time massive paper rate, oscillograph printers. GPIB data stream capture laptops, with FFT analysis. Yes even stethoscopes! Let us identify the heart of the problem, on site. "Joukowski" velocity jump, excites RV. it is stopping one cylinder filling - TOO LONG. For more on the "manifolding" examples, right, please see Octopussies LDi Pub. 5. P34, 35. Where:- 1. They are oversized, 2. Direction changes are causing instability., 3. "Ts" & "Hard 90s" need replacing. 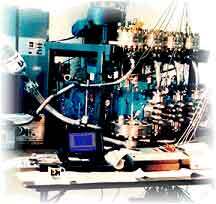 NO =RPM doubled from 1950s design, valves driven off seats by suction column oscillation. 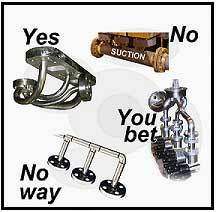 YES = Stop valves from "talking" to each other. NO WAY = Typical Manifold turns pulse into an "orchestra".